High in fibre. Gluten free wholegrain oats. Flaxseed, sunflower and chia seeds. 4 pouches of 5 oatcakes. Keeps the oatcakes fresh. Perfect for on the go. Seeds for flavour and protein. No added sugar- contains only naturally occurring sugars. No artificial colours, flavours or preservatives. No hydrogenated fat. No GM ingredients. Suitable for coeliacs and vegans.Naturally energising Nairn's oatcakes are packed full of wholegrain oats which are naturally delicious and wholesome, and can contribute to a healthy balanced diet. Wholegrains are a rich source of fibre, vitamins and minerals - oats are high in soluble fibre and also naturally contain manganese**, phosphorous**, magnesium, zinc, iron, folate, vitamin B6 and thiamin. Our oatcakes contain nutrients** that contribute to normal energy-yielding metabolism. Oatcakes are deliciously versatile. 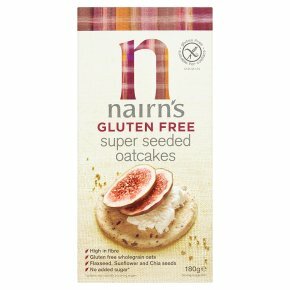 Try soft cheese and ripe fig on a Nairn's Gluten Free Super Seeded Oatcake, or a chunk of cheddar cheese with sliced tomato on a Nairn's Gluten Free Cheese Oatcake. Why not experiment with your favourite sandwich filling as a topping? We've given range of gluten free oatcakes and wholegrain crackers to choose from. They're perfect with a topping, with cheese or as an accompaniment to soup or salad - you might even find a new favourite!